← day 26 // celebrating, remembering, + the wave of light. day 27// a beautiful home. Tommy and I love working on our house. I’m sure you know that if you read here often. It started out of necessity with our first house. Serious necessity. We loved that house, but no one else seemed to love it like we did. I miss that house a lot. But more than the house I miss our neighbors and our friends in Maryland. It was a great place. When we moved back to Tennessee we were pretty tired — we had a 5 month old and had done countless hours of projects on our house. So we decided to look for something newer. Our house now is new. We still call it new even though it is 10 years old now. Our first house was built in the 1940s, so a house built in 2004 seemed entirely new to us. It didn’t need a lot of work — or any work really. It was basically as bland as the way it was built. Seriously. The kids bedrooms upstairs were painted, but other than that not one thing had been done to the house outside of the way the builders left it in 2004. It took a little while but we got over our “we’re tired and just want a new house” attitude, and we have been working on turning this house from a completely builder grade house to something that more reflects us. 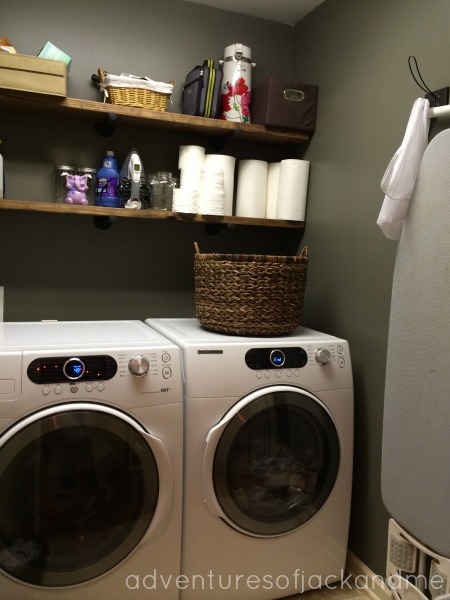 My very favorite thing that we have done so far is the laundry room. I spend a lot of time there, and because of it’s location, it’s a room we see all the time. It’s on our main level, so we walk past it many times a day. I love that it’s a pretty room now! I cannot get over it. We negotiated the washer and dryer in the purchase of the house, so these were here when we moved in. The previous owners had them stacked and had a tall metal shelving unit beside them. 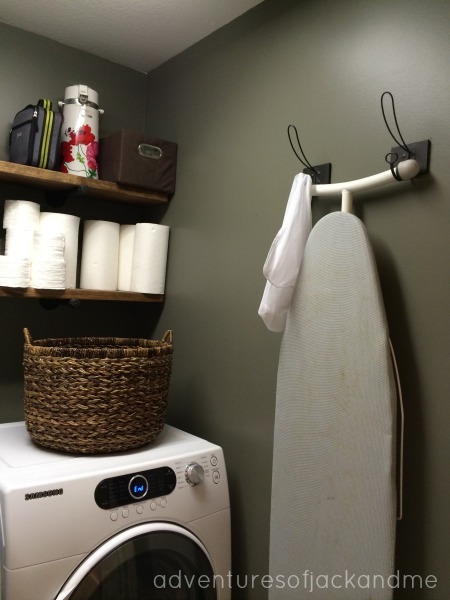 They used it as storage, and while I can definitely understand the need for storage space, I also really need laundry space. So as soon as we moved in, we moved that unit out to the garage. To kick off this project, my brother and sister came over to help Tommy move the dryer down. I wanted the machines side by side and not stacked. Apparently I didn’t take a picture of what it looked like stacked, so here are some in progress pictures. I showed Tommy a picture of what I wanted for shelving, and he made it happen. This is a Restoration Hardware knockoff project. And this project was cheap! I decided I wanted to go dark for the paint color, and I’m so happy I did! I absolutely love it, and now I want to paint all of our rooms dark! 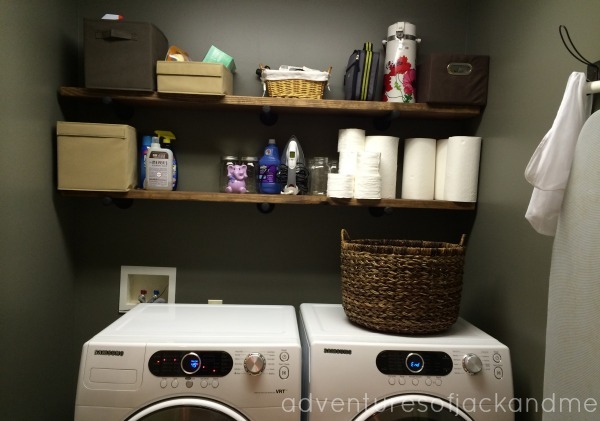 Here is my updated laundry room! Beautiful rooms in my home make me smile. Beautiful rooms make me smile too! This looks fantastic!